aka, I need your help. I've decided to go ahead and create a blog about living with food allergies, intolerances, and preferences (vegetarian, vegan, religious restrictions) in suburban America. You know the famous saying, "Write about what you know?" Well, it's kind of true. But I want this blog to eventually become a resource for more than just gluten intolerant people living in South Bend. *ahem* That's where you come in. On the blog, I will have recipes, restaurant reviews, grocery shopping guides, product reviews, and other online resources to check out. So, if you have any of the aforementioned items (a great allergy friendly recipe? a to-die-for product? a website that has never let you down?) then by all means! Email it to me with any links, pictures, or whatnot that can go with the information. Also, give me your name and your website and your location so that when I add it to the blog, I can give you praise and accolades. Because who doesn't appreciate that?! Even though I've lived in the Michana area for many years, I hardly ever got over to Elkhart. It was just this fringe city to me that I never managed to get to. However, I now work right in downtown Elkhart! Even though it's a smaller city, I'm still excited to explore all that there is to be seen here. Just a few blocks down from my office is the Sweet Creams Soda Shop. 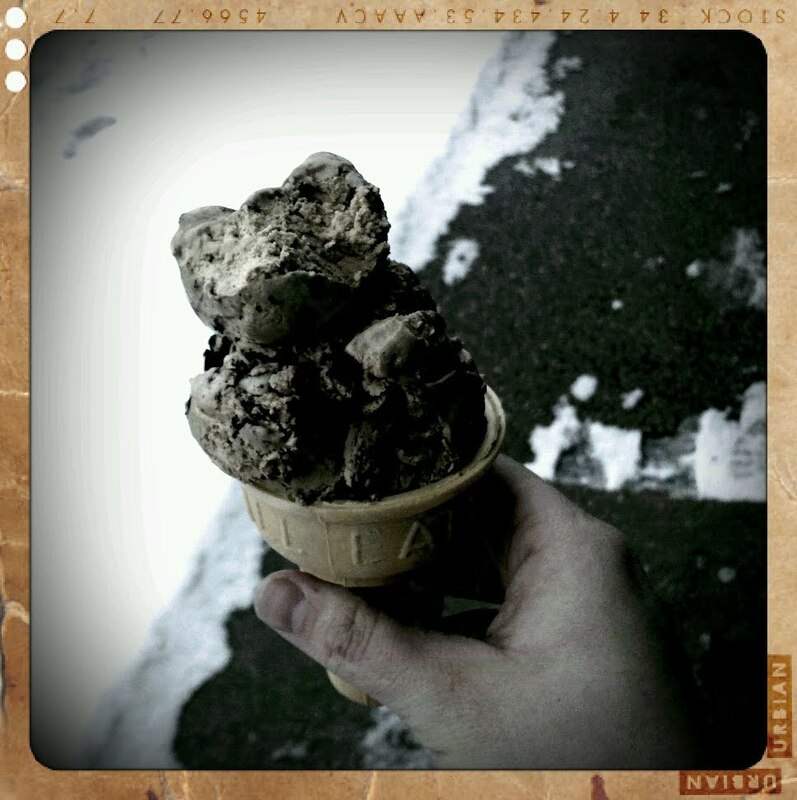 Desite the freezing temperatures and snow on the ground, I decided I wanted some ice cream! What an adorable little treat I was in for! This soda shop is in a 110 year old brick building, and upon walking in, you feel like you've stepped into a 1950's style, small town setting. They have a working vintage soda fountain and there's an old juke box at the end of the rows of booths. An older gentleman was sitting in one of the booths when I walked in. He looked up and said to me, "If you're wanting food, I can go get her. But if you'd just like some ice cream, I can scoop that out for ya!" I smiled and told him I was interested in the ice cream. 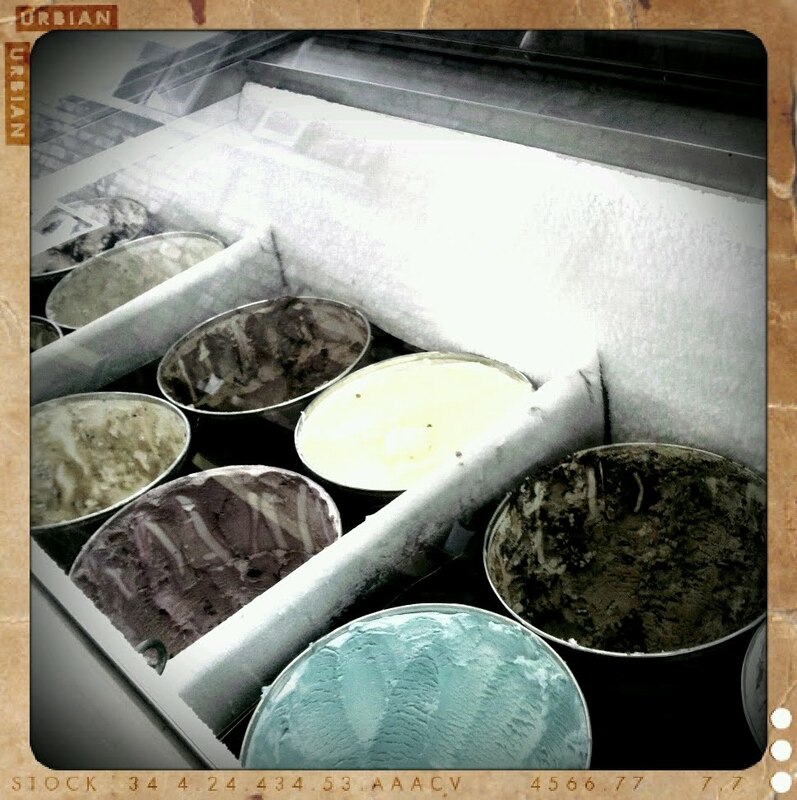 Sweet Creams serves Valpo Velvet ice cream, which is a locally made ice cream from Valparaiso, IN. I asked for the coffee chocolate fudge oreo ice cream in a cone. While he was scooping out the ice cream, the gentleman told me about the business. 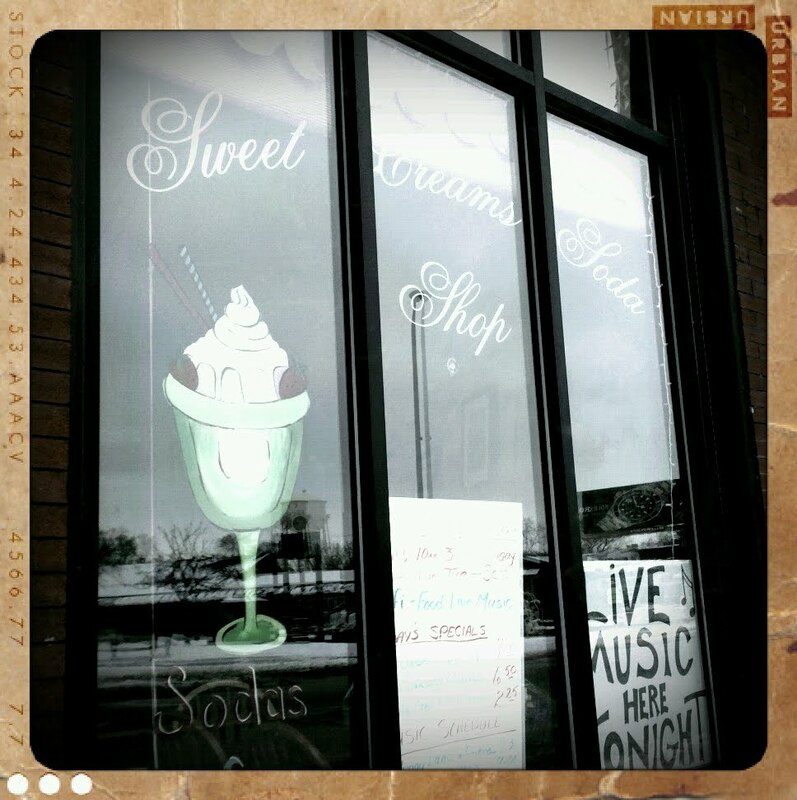 Sweet Creams is owned by a woman who also gives art lessons in a back room attached to the soda fountain. The artwork of her students is hung in another room where the shop frequently hosts live music from local musicians. The musicans are most frequently folk, americana, jazz, and similar genres. There's someone playing almost every evening, the man told me. The Sweet Creams Soda Shop has more than just ice cream! This seems like a great lunch location for anyone working near downtown Elkhart. They also serve Vienna beef hot dogs in several different styles, in addition to sandwiches and other light eats. 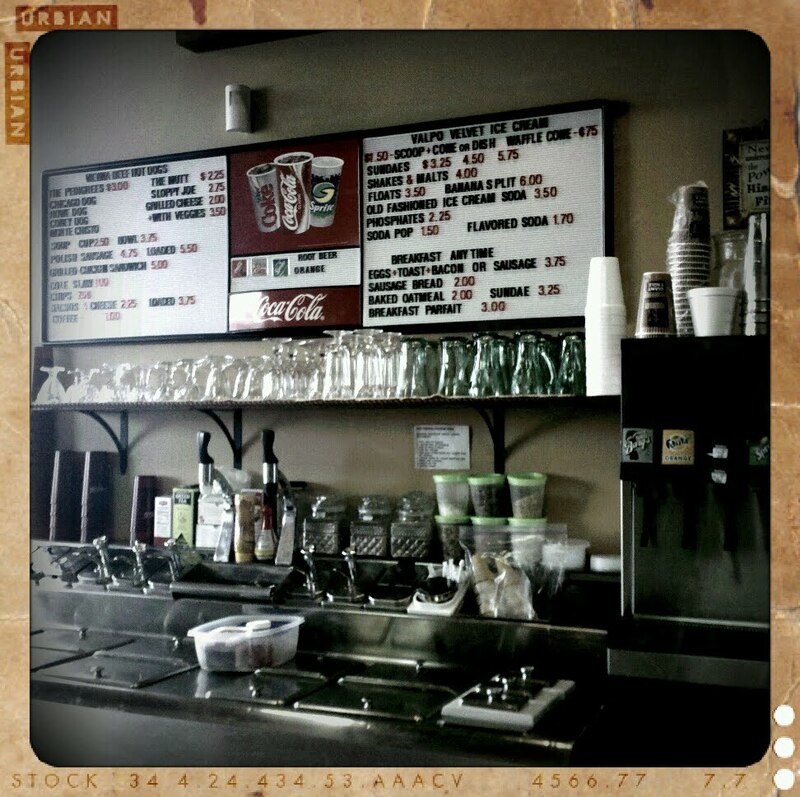 It is definitely true to the old style soda shop feel in its atmosphere and menu offerings. 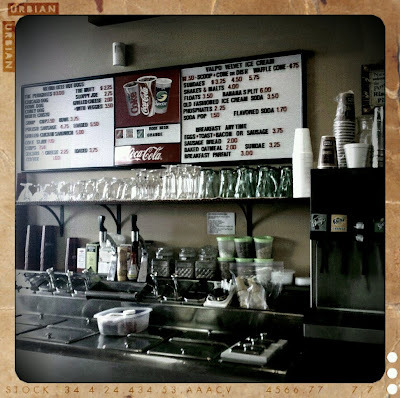 The soda shop doesn't appear to have an official web page, but they do have a facebook group you can check out. They're open Monday through Saturday from 8:00 am to 10:00 pm, and they're located at 700 S. Main St in Elkhart. Check them out and go in the evenings to enjoy some live music! Woah! Guys! I've kind of abandoned you for a bit. My new job has left me very busy and the gap in paychecks has caused a bit of a stunt in being able to go out to eat and review different venues. However, I have gone to two places recently and I'll be blogging about it soon! But I have a question for everyone... specifically people in the Michiana area, but really, anyone who lives in a surburbian demographic. I've noticed that especially in my area, there's not many food blogs as is, but really, there's even less allergy/food intolerance resources. I feel this is especially true for anyone who lives in suburban mecca dominated by chains. When I lived in Pittsburgh, I had access to Whole Foods, Trader Joes, and lots of local grocers that specialized in food needs. There were also a lot more restaurants, increasing my options to eat according to my food needs. Upon moving into a more suburban area, it's gotten tough. If I were to start a food blog on allergy free living in suburban areas, would there be an interest? Would you or someone you know be interested in reading? Obviously, I would be blogging from the Michiana area, but I would try to tailor my posts to any suburban readers, especially by including recipes in addition to restaurant reviews. Thoughts? Opinions? Feedback? Let me know! 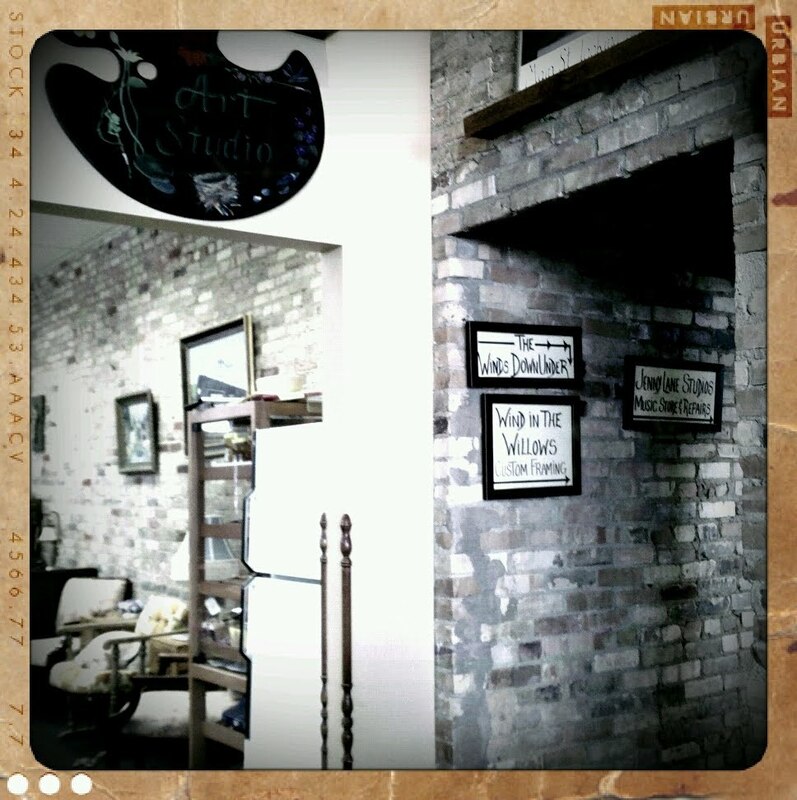 So last Saturday, Vince, Anna, and I went to Main Street Coffee House to listen to Kevin Joiner perform. If you've never heard Kevin Joiner or if you've never been to MSCH, then you need to snap to it! Both are fantastic. Truth be told, I've known Kevin since he had his band Kevin Joiner and the Expedition and he performed a lot at Fiddler's Hearth. But these days, he's been doing a lot of his own thing as Kevin Scott Joiner and floating around between Chicago and the South Bend area. Kevin's music falls in line with some of my favorite styles as an acoustic guitar driven, modern folk/Americana, with some blues-ish roots as well. Look at this man in his go-to-hell pants and jacket. So stylish! And such a great musician. I love him. He's also been working on a web based series called "A Conversation While." They're video shorts that center around a crime comedy that get to some of the deep philosophical questions in life. The videos are released on YouTube with the intent of having an interactive discussion based on the video topics over at the series' Facebook page. Main Street Coffee House, the venue that hosted Kevin, is a fairly new addition to South Bend. As per its name, it is right in the heart of DTSB on Main St. across from Chase Bank. I've been here a few times, and I'm really glad that they've opened up! Other coffee shops have had this location and failed, but I think the setup and atmosphere of MSCH will be successful. It's always great to see local endeavors in the city, and I tend to have a bias towards supporting them. Main St. makes some delicious mochas, let me tell you that! They serve all of your typical coffee shop drink varieties, along with sandwiches, soups, and a decent array of desserts. I feel like MSCH is a great example of a local business making good use of social media because if you follow their Twitter account or their Facebook page, you'll have a great idea of what their specials or food rotations are. It's awesome! I've always seen a decent handful of people every time I've gone into MSCH, and it is normally either college students or business professionals that frequent the venue. I know I've become a big fan of their leather couch seating area. It's a great place to take your laptop and your work, grab a mocha, and get lost in your studies or proposals. Plus, I feel like the seating arrangements and decor of the location are more inviting and warm than your run-of-the-mill Starbucks. Kevin did a great job performing, and I think the music he selected suited the venue well. It was definitely a joy to hear some of his new material while catching up with friends and enjoying cheesecake and coffee. MSCH has live music fairly often. You can check out what's on their schedule here. And if you're interested in seeing Kevin Scott Joiner, his Facebook fan page is probably the way to go for seeing his performance dates. My girl, Anna, excited to check out the cafe for the first time! Vince and Kevin chatting about music between sets. I think this would be a great "create a caption" photo. So how about it. Write a caption to go with this photo for me! Kevin performing some of his more recent music. Vince, becoming in tune with his four-shots-of-espresso mocha. Oh, and see that checkers table cloth? If you visit the cafe with a study buddy, be sure to try and snag that table, because it can be a lot of fun to play a game of giant checkers when you're starting to go cross eyed from studying your exam questions over and over again. Just sayin'. Me and Anna -- complete opposites! Blonde hair and black hair with just as vastly different personalities too. :-) But we've been friends since we were about 10 years old! Love her! Also, I can't forget to tell you that if you're a student of one of our fantastic area colleges, be sure to bring your ID card to get 10% off your food and drink at Main Street Coffee House! That's definitely a nice perk. Oh! And want to know another cool fact about this cafe? All of their coffee is roasted in-house. Yeah. Pretty sweet, huh? So go check them out and support one of our local businesses. 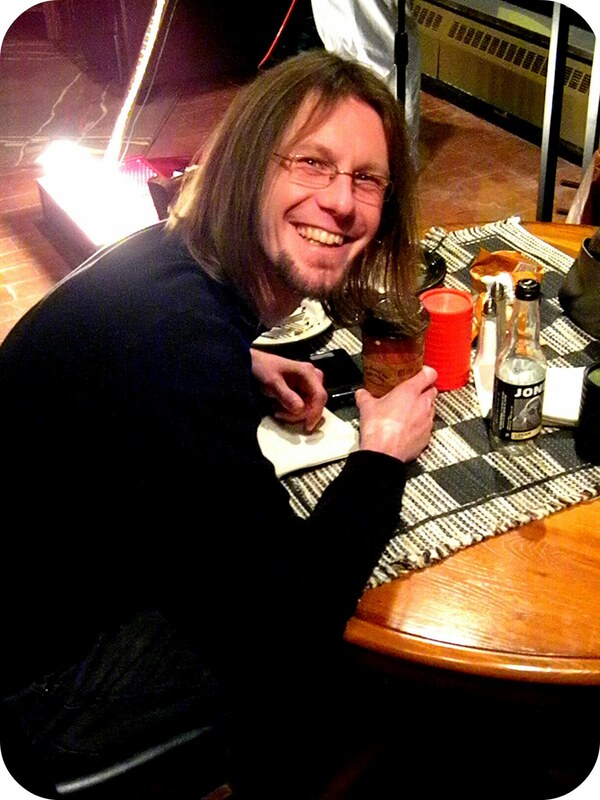 And don't forget to scope out Kevin Scott Joiner as well. These are two fantastic elements to South Bend, and you definitely want to be in the know. For those who are unaware (but I highly doubt this), the Midwest has just experienced a blizzard and is under a state of emergency. Almost every business closed their doors, and all government offices even shut down for the day. St. Joseph and Elkhart county warned that only emergency vehicles should be on the road. Snow throwers and the scraping of shovels could be heard in all neighborhoods. I got text messages from friends who were going stir crazy with cabin fever over just one day of being snowed in. While humankind went into a state of panic and confusion over what to do with 2+ feet of snow, do you know who was completely unaffected by all of this? The birds and other animals, that's who. My mother is the bird whisperer, and I am not kidding about this. She has spent years cultivating our back yard and turning it into a kingdom for all winged animals. There must be 5-10 bird feeders outside and 2 bird baths. She creates this peanut butter concoction that she puts in holes inside this wooden feeder, and the birds go bad for it. She could tell you better than I all the variations of birds that she's seen in our yard. There is a "Birds of Michigan" book that she keeps by the window where she marks each bird she's seen come to her feeders. I've seen cardinals, blue jays, chickadees, sparrows, and several different types of woodpeckers. (Those are my favorites -- I like their red heads.) Sometimes I think that our back yard could rival the National Aviary. While all of us humans were running in circles over unplowed streets, stuck vehicles, closed retailers, and snow days from school and work, nature just kept going. The rhythm and life just kept on its course. Squirrels chased, birds flighted, deer hid in the bushes, and their lives went on living as blissful and naturally as any other day. I think I should like to construct the philosophy of my life around the simplicity of a bird. I realize that I'm a bit late, but here are some pictures that I took during the Hunter Ice Festival. While I did wander into businesses and take pictures at different venues, I'm going to separate those into their own posts. The following shots pertain mostly to the festival itself. The Paris soda fountain shop. A place I definitely want to try for a review! The working ice merry-go-round that the Food Network came to film! An underwater mural off of Main St.
More ice carving at work. I hope everyone had a fantastic time at the Hunter Ice Festival and used it as an opportunity to explore the great businesses that downtown Niles has to offer. I firmly believe we are a budding city that holds great potential! Thanks to the festival, I discovered Squeeze Juice Bar and the soon-to-open vintage vinyl cafe called Rumor Has It. Hopefully I'll be able to bring you some coverage of Rumor Has It once they host their grand opening on Feb 12th. Be sure to check them out that day! I caught of preview of their space, and it looks like it's going to be a pretty swanky setup. Since I began blogging at the age of 14, my sites have always been a mix of everything that interested me. Whether it be discussing music, posting my photography, a recipe, a business review, or a personal rant, everything has always been jumbled into one personal blog. This has caused my blogs to lose a lot of direction, and I believe it has inhibited the success I could have had, had I included more focus in my writing. 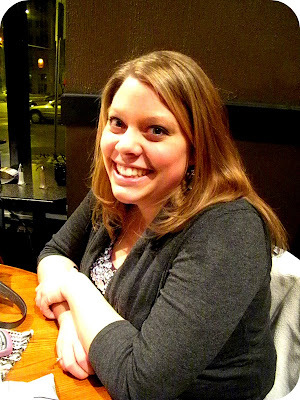 While I've attempted a food blog, photography blogs, and the like, I never kept them isolated. I think this time around, I need to be more determined to streamline my content. "Hey there, Scout!" is going to turn into my "exploration" blog of sorts. I intend on exploring local restaurants, cafes, boutiques, and other businesses and featuring them here on my blog. I would also like to cover special events and festivals and use these two avenues as a way to strengthen my photography skills. I've kept a few back posts on here because they either cover an event/venue or capture some of my photography. Many others, I have deleted because they disturb the flow of the postings. But from here on out, I fully expect to redesign this blog into one of neighborhood exploration and discovery. Join me as I find everything fantastic that the Michiana area (and beyond!) has to offer! Hey there, I'm Scout! I live, work, and play in the Michiana (Michigan/Indiana border) area and I'm exploring all that there is to do and see here. Follow along!